Are you hearing about hands-on making and STEM or STEAM initiatives and looking for real ways of integrating project-based learning in your classroom? Want to meet like-minded teachers exploring making and design? Beginner or advanced alike, all teachers are invited to the 2nd annual East Bay Mini Maker Faire Educator Meet-Up on Sunday, October 18th. Last year 75 educators connected with colleagues and had a chance to see what this “maker” fuss is about. It was so successful there was no question about doing another. The framework? Start the day with your peers and some coffee and donuts. Get out and take in the Faire. Come back and have a chance to compare notes over lunch. Get out there again. = Simple. In addition to the morning and lunch meet-ups educators will find hands-on activities and consultants throughout the day at EDHACK, organized by the EBMEM (East Bay Maker Educator Meet-up). EBMEM is sponsored by Agency by Design (AbD), an educational research project housed at Harvard’s Project Zero. AbD has been a three year investigation into maker-centered learning with an action research component that took place right here at six Oakland schools, including Park Day, Oakland International, and Emerson Elementary. AbD has yielded some powerful understandings and tools to help educators build meaningful maker-centered learning experiences into their teaching. AbD-Oakland team members will be at EDHACK/EBMEM to share some of these understandings and tools. 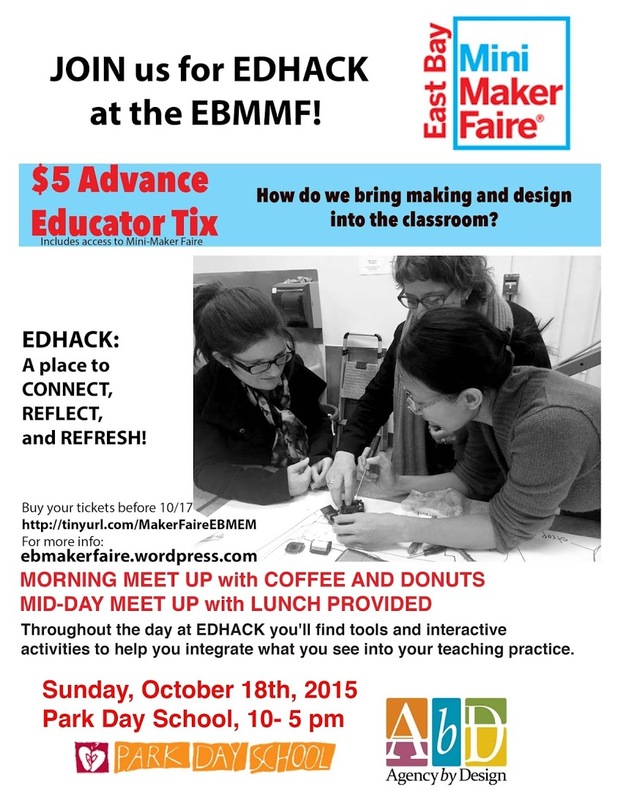 Register here for the EBMMF Education Meet-Up: http://tinyurl.com/MakerFaireEBMEM. Note only educators are available for this ticket; friends of educators need to purchase regular tickets. There’s a booming awareness of the importance of making in education, and the East Bay Area is a hotbed of activity. Don’t miss this chance to connect, tinker, learn, and make. Register today! Fly with the Paper Airplane Guy! John Collins designed “Suzanne,” the paper airplane that set a new world record (226 feet, 10 inches! ), and he’ll be sharing techniques at the East Bay Mini Maker Faire on Oct 18. He’s a creative designer, an avid tinkerer, and an enthusiastic designer. 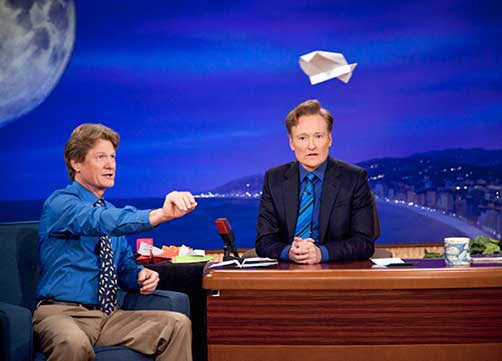 Watch Conan O’Brien experience the extraordinary acrobatics of John’s planes, including his innovative “Sizzle” glider. Every throw is an experiment. It’s a hobby that begs the paper pilot to understand ever more in order to excel. Hypothesis, experiment design, trial, and results—it’s all built into every plane and every throw. To play with a paper airplane is to dabble in science, whether you know it or not. How did you get started making paper airplanes? The truth is, I never stopped. I’ve always loved paper airplanes and flight. Just when I was starting to get into paper airplanes, two really amazing things happened. The Smithsonian sponsored an international paper airplane contest and published a book with the winning designs. And not too long after that, the inventors of the Klein-Fogleman wing were profiled on television with their paper airplane design. It was a stall-proof paper airplane, one that might have application to full size planes. These two events demonstrated the wide interest and possible fame and fortune attached to paper airplane making. I’ve been hooked ever since. Have you seen any especially innovative or surprising designs? I’m continually amazed by engineering prowess in the flight world. Asymmetrical designs, like Burt Rutan’s Boomerang, are really intriguing. The current wave of drones is fascinating. Drones are the cutting edge of small scale flight. That puts paper airplane sized aerodynamics front and center, so once again, what a paper pilot can learn or invent can have widespread application. What makes a bad plane? Well, I’ve had comments on my YouTube channel calling the world record plane a terrible design and a waste of time. Generally, I find it’s not what makes a bad plane; it’s who. Sloppy folding is bad, but it’s not the worst offense. Assuming all the work is done once the plane is folded is the biggest mistake. One throw does not determine quality. The Wright Brothers crashed 100% of the planes they built in the early days. Until you get the hang of adjusting the paper airplane, you’ll see some awkward flights. Treat your plane like an experimental aircraft. Mess with it, over correct, junk it up, and just play with it. Keep trying things to make it fly better. There’s no telling what you’ll discover. Want to try some planes? Here John demonstrates how to build several planes, including a stunt model, the classic Dart, and the speedy Phoenix Blaster. OR get your tickets to the Faire and come and learn in person from John! 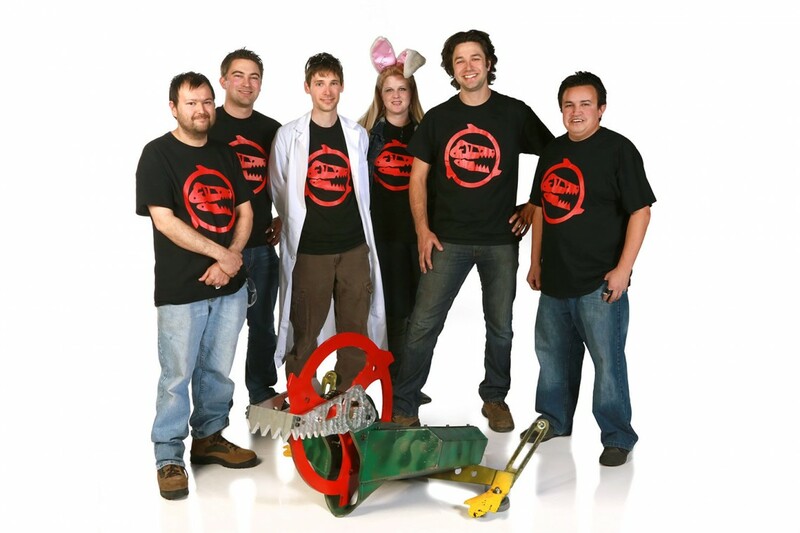 Meet the Makers of the 2015 East Bay Mini Maker Faire! So much making goodness to be proud of in the East Bay! Take a look through the 2015 Makers page & check out the crazy RANGE of projects that will be there for your grokking on Sunday, October 18th. Check back for updates—the list of confirmed makers will likely grow each day until October 18th! 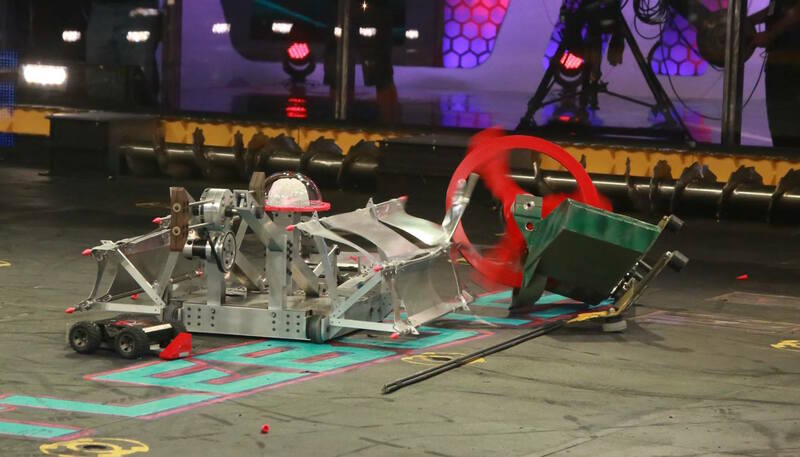 Some robots build, others serve or assist, and some, like Wrecks the heavyweight Battlebot, destroy. 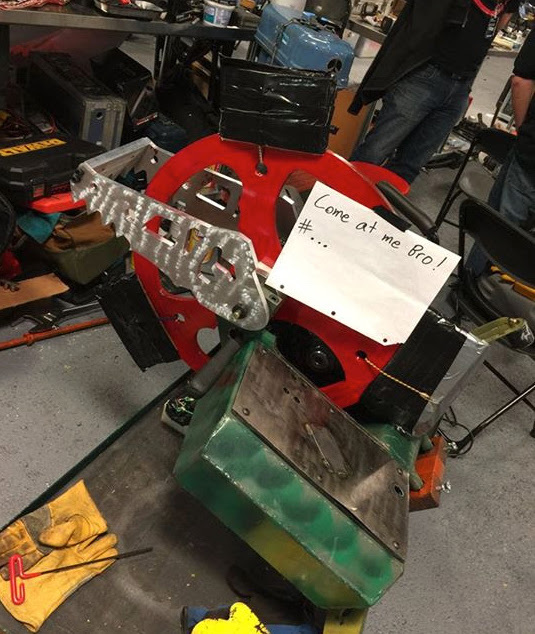 Battlebots are hardware gladiators. They have their own TV show that recently was revived on ABC, and Wrecks is among the biggest of these competing this year. The heavyweight category, which initially included entrants from 120 to 220 pounds, last year accepted 250-pound competitors like Wrecks. Operated by remote control, the armed and armored machines fight in an arena designed for single-elimination combat. Wrecks’ spinning steel disc provides it with both an effective weapon and a means of propulsion. But the wheel never touches the ground, instead propelling it forward through gyroscopic procession. By tilting the spinning blade, Wrecks rocks back and forth, scooting ahead on its large rear foot. As a “walkerbot” without wheels, Wrecks would have been granted a weight bonus according to early Battlebot rules, but that provision was removed by the time Wrecks entered competition, matching this against other heavy ‘bots. Inspiration for Wrecks came to designer Dan Chatterton after watching an antweight robot named Gyrobot. He joins other Team Wrecks members Joe Sena, James Arluck, Orion Beach, and Adrian “Bunny” Dorsey, along with team captain Micah “Chewy” Leibowitz. Micah once turned a dog-house into a robot. Come see what this East Bay-based warrior can do! The first round of acceptances have gone out to an aweome range of makers for the 6th annual East Bay Mini Maker Faire on Sunday, October 18th. In part to help all those dusting off, we are extending the CALL for FABULOUS PROJECTS and MUSIC and WORKSHOPS and PRESENTERS into next week. Only “Mini” in relationship to the “Monster” Maker Faire Bay Area, our Oakland show welcomes over 7,000 people to a one-day extravaganza of East Bay (and beyond) talent. COMPLETING THE SIMPLE MAKER APPLICATION IS THE KEY: https://ebmakerfaire.wordpress.com/call-for-makers/ Space is limited; rolling acceptances from here on out based on based on space/quality. If you have questions or ideas, please get in touch directly with the Maker Relations team at makers@ebmakerfaire.com. We’d love to work with you to make some amazing things happen. 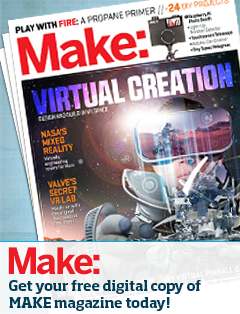 Calling all young makers! 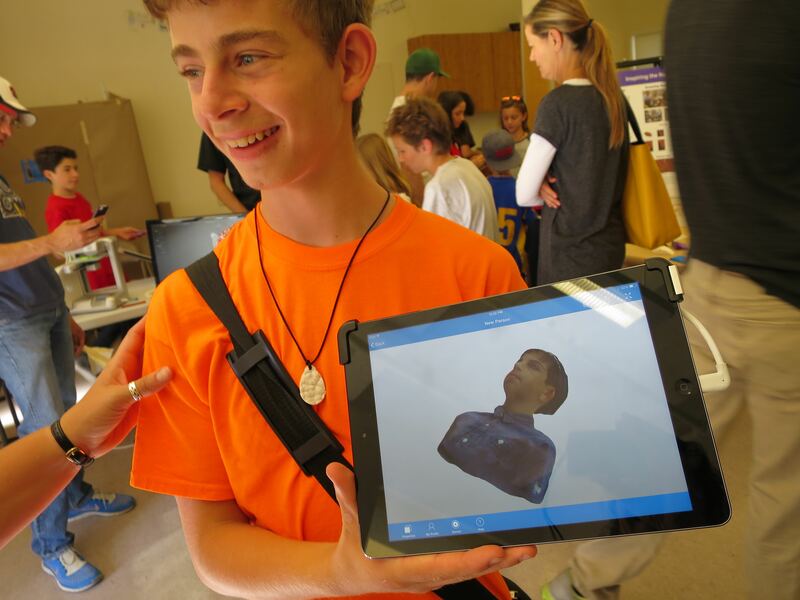 Show your project at East Bay Mini Maker Faire! We’ve got a new section of the show in mind where you can show projects just for 2 hours. So you don’t have to miss the whole Faire to show your stuff! Just fill out the Call for Makers form & we’ll get back to you with more information on your booth. Also—you can sell your projects! Young makers who have worked out a product and have created some inventory to sell should apply too. Take Pufferfish Swords as a great example—they have had a booth for a few years now at the Faire, offering DIY duct tape and foam sword making that is a huge hit. Two hour kid “commercial maker” booths are just $10. What have you made lately? Come and show it off at the Maker Faire! 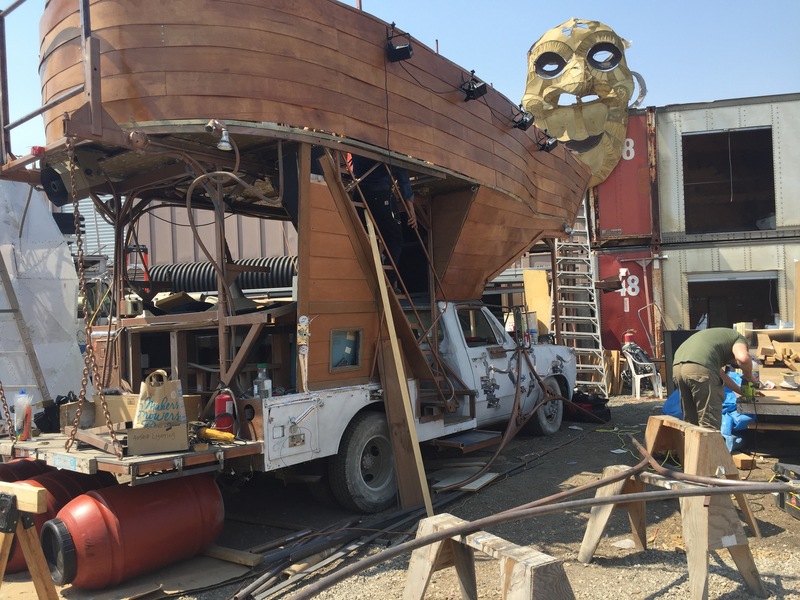 Burning Man countdown is on! 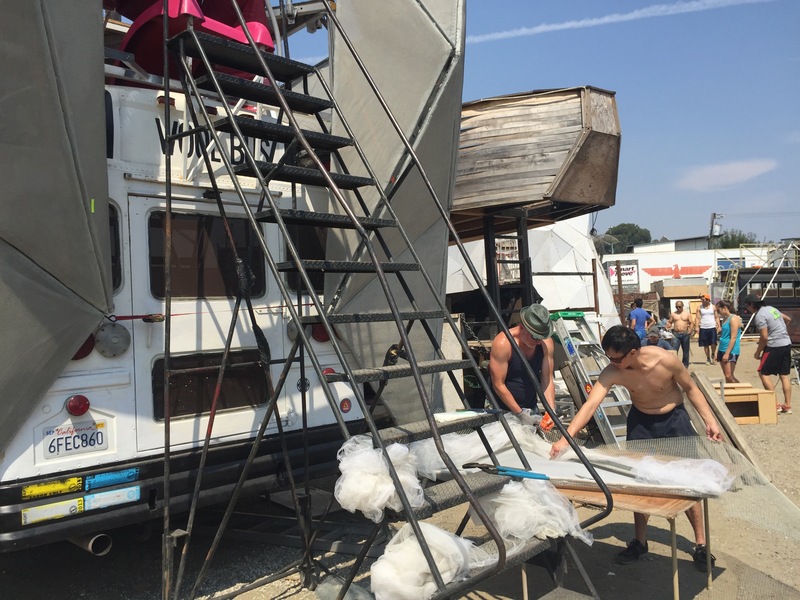 Teams are working long hours to get sculptures, art cars and camps ready for the trip out to the desert. Saturday I stopped out at NIMBYspace and got to witness the happy making frenzy. Music going and teams of folks pooling time and energy, getting sweaty (100 degrees!!) and dirty, getting their fun ready to head out to the desert for the epic annual art fest. 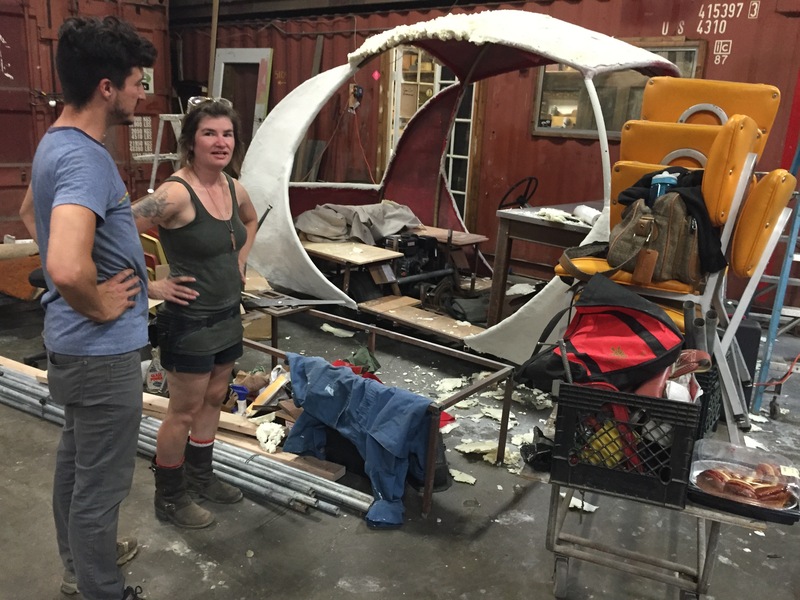 NIMBYspace is one of Oakland’s maker crown jewels, a home to many makers — not just Burning Man projects. 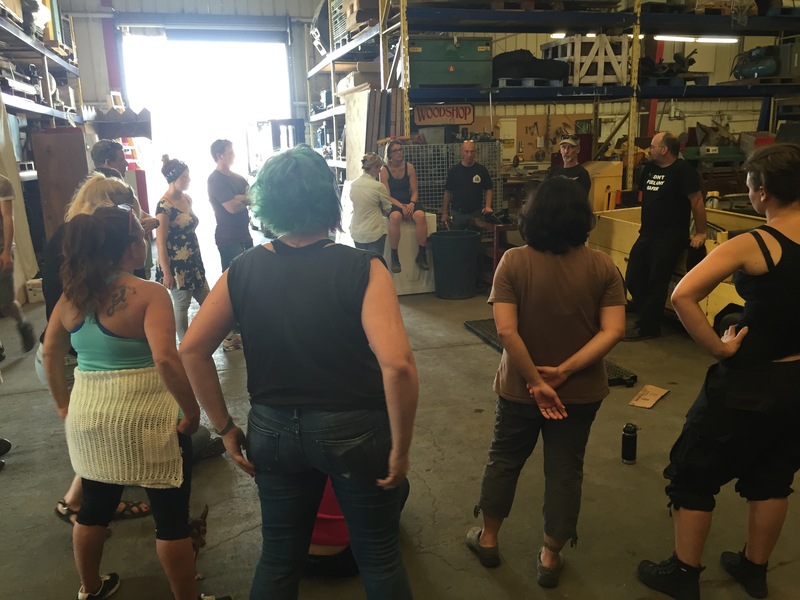 It boasts 70,000 square feet of studio space (most indoor + quite a lot of outdoor build space), plus a shared woodshop and a shared metal shop. It’s located down by the Oakland Coliseum. It is our goal for makers to not just create but to also experiment and explore. This supportive culture is at the root of the amazing art that emerges from the doors of our unique community. No one can do it alone, and by placing a high value on collaboration and diversity an environment emerges for innovation and freedom of expression. 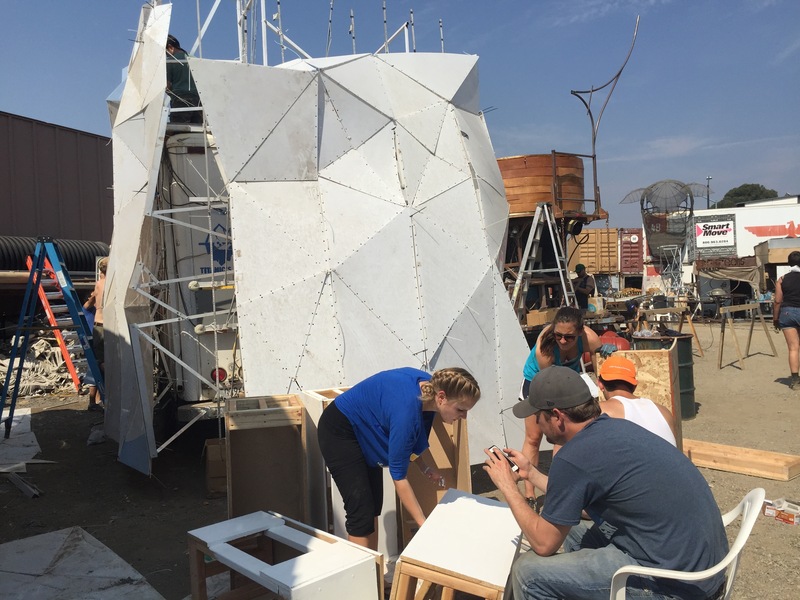 NIMBY is a community and volunteer driven space with a commitment to bringing the maker experience to local schools, community groups, and the neighborhoods of Oakland. 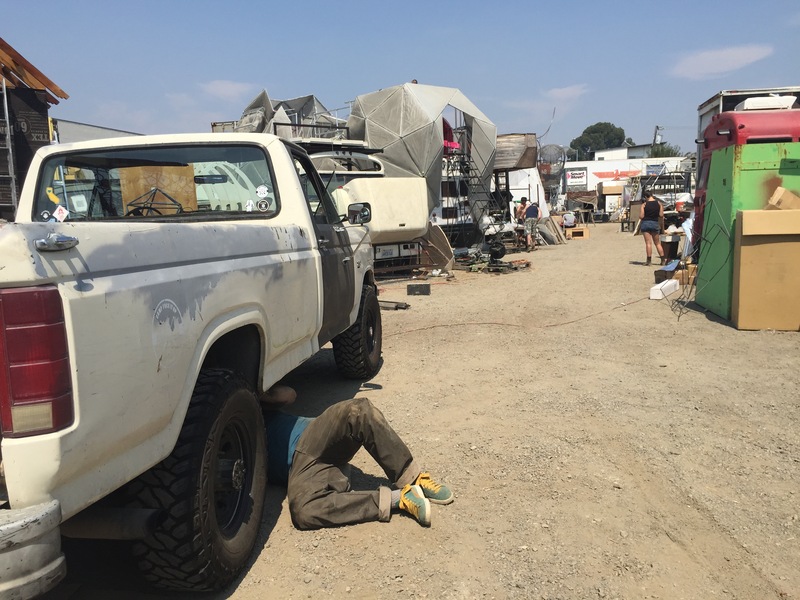 The compound is one of the cornerstones of East Bay maker habitat, not to mention our Faire. Snook and Dave and Dave and Clody and others have been a huge influx of great activities (sheet metal tool boxes anyone?!) and art at East Bay Mini Maker Faire, and it seems like 2015 is going to be a banner year for NIMBY at EBMakerFaire. Talked to loads of Burners and non-burners about our show and I’m excited for what folks seemed interested in bringing out. Meanwhile, best of luck to all teams with their projects! See you on the other side. Making sure your transpo makes it is a priority. Makers! 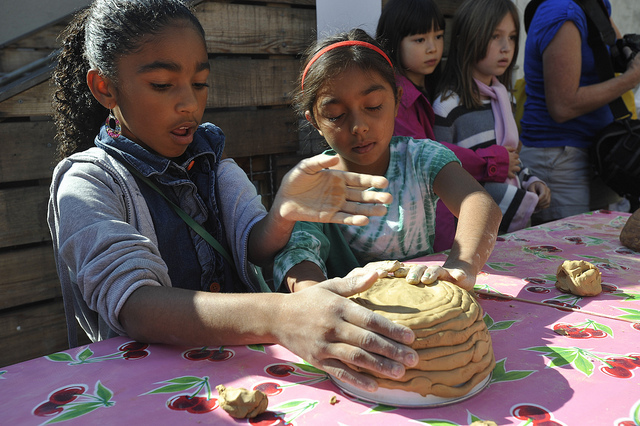 Show your work at the East Bay’s own Maker Faire! As is true with all Maker Faires, booths are free for non-commercial participants. And also true is that it doesn’t really matter all that much *what* you are making, but more your interest in sharing what you learned while you made it. Chances are you’ll meet a whole bunch of really interesting people, learn a few things yourself, and have a great time. Read all about our 6th annual Call for Makers, Presenters and Performers — and apply early for priority placement. 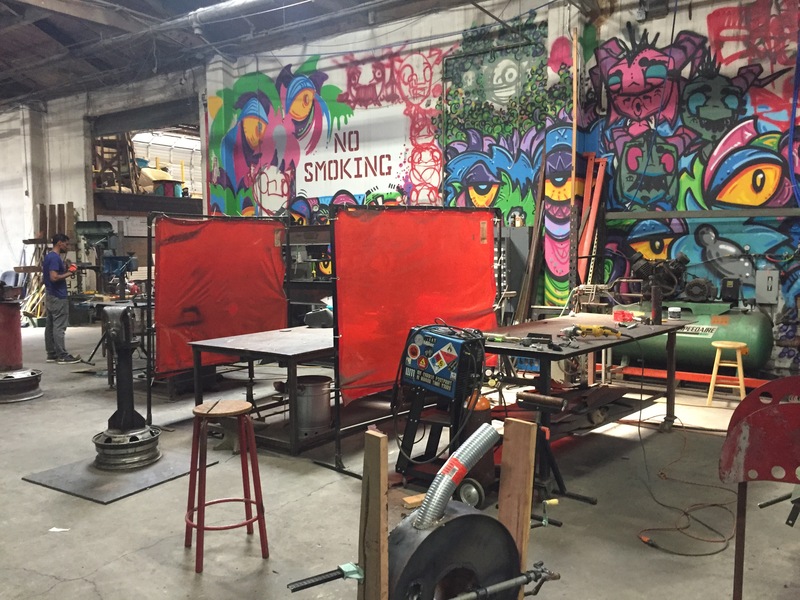 American Steel Studios, Oakland’s six-acre makerspace, was home today to a huge inaugural festival for new Mayor Libby Schaaf. 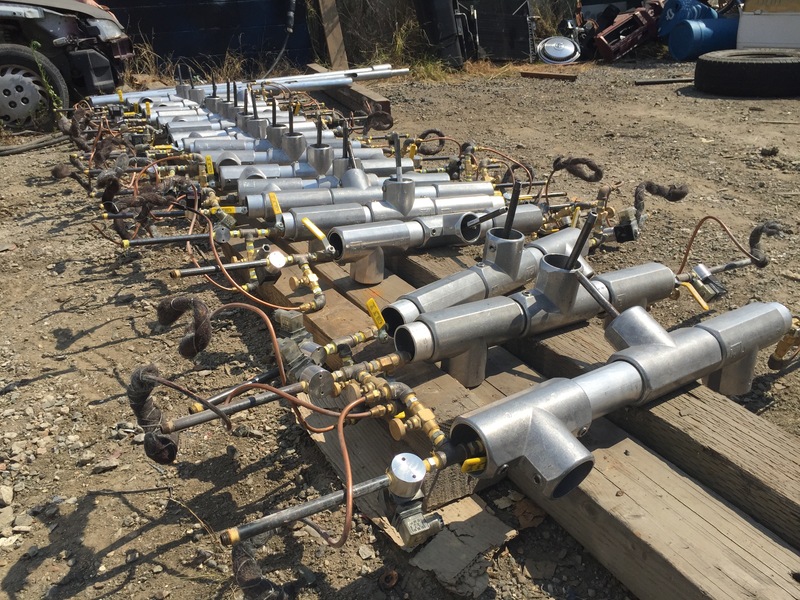 Schaaf, whose branding centers around a “Made in Oakland” theme, has repeatedly paid tribute to the thriving maker scene in Oakland, and has been getting lots of press with her recent rides in Oakland’s famed Snail Car. Schaaf has got to be the only Mayor in America to have thrown their inaugural ball in a makerspace. Former Oakland Mayor and current Governor Jerry Brown cruised American Steel today with Schaaf. Congresswoman Barbara Lee was on stage and paid tribute to Libby and Oakland. 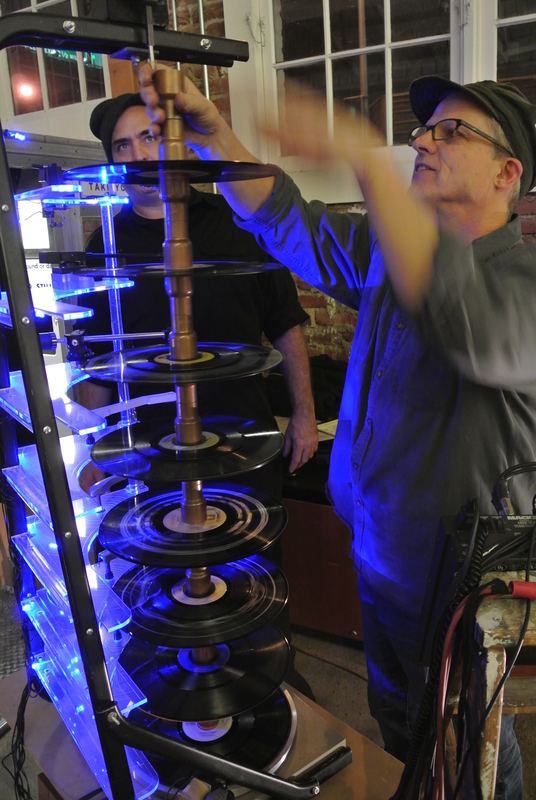 Artists and makers across the tech and culture spectrum were out in force. “This is not your Daddy’s inaugural ball!” said Schaaf, before leading the huge crowd in the cupid shuffle. What does all this mean for makers? Clearly it’s too early to know, but Schaaf was (as Councilperson) behind Oakland’s new 1% for the arts law. An inaugural ball in one of the city’s premier spots for making is an auspicious start. P.S. Note our 2015 date is up! Libby, you’re more than invited on Sunday, October 18th—let’s get together to talk how this event can greater benefit Oakland and East Bay makers. Doing it Together is powerful stuff. 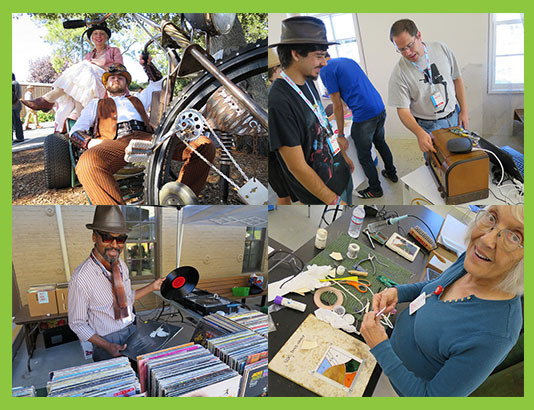 East Bay Mini Maker Faire is an absolute manifestation of team work and collaborative energy. Together we threw an amazing celebration this past Sunday: a showcase of creativity, invention, and curiosity. Close to 200 makers generously shared their talent, wit, passion and projects. Over 250 Park Day School parents + unaffiliated helpers took shifts to power everything from hands-on making booths (e.g. Nerdy Derby, rockets, Swap, Learn to Solder) to parking to tickets and registration. 95 exhibits offered hands-on making or interaction. 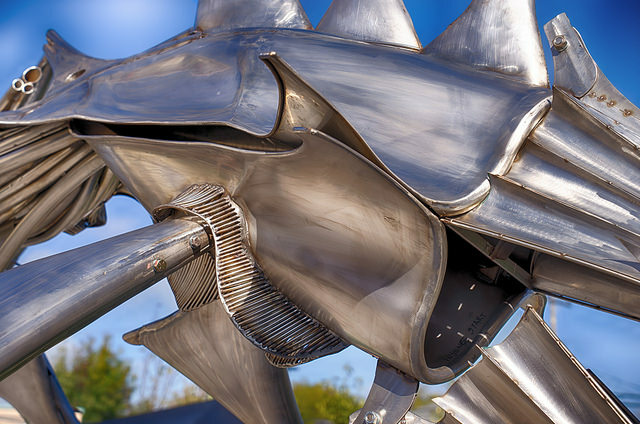 Sponsors gave in their own way—enabling budget for the jaw-dropping installations, or donating in-kind with infrastructure and supplies. A core team of 10 or so plugged away months in advance to push this baby to fruition. Together we brought together 7,000 happy people on the combined Park Day School + Studio One Art Center campuses. Whether working or just experiencing the show, it felt like most people were experiencing something new, and receiving some bit of re-charge and inspiration. Thanks for not just coming, but for contributing, and for making this day with us. Keep the making going — check out our Resources page for makerspaces and maker meetups — and see you back again in October 2015! P.S. We’d love to see more pictures! Send links to info@ebmakerfaire.com.